"A growing nation of genetically evolved apes led by Caesar is threatened by a band of human survivors of the devastating virus unleashed a decade earlier. They reach a fragile peace, but it proves short-lived, as both sides are brought to the brink of a war that will determine who will emerge as Earth's dominant species. Written by Twentieth Century Fox"
If you want to know even more they've got a full synopsis here. But seriously it's better to go watch it. What did this hairless ape think of the movie? Well the previous movie Rise of the Planet of the Apes was a pretty good movie. Far better than Tim Burton's Planet of the Apes which was only interesting if you we're stoned after eating too much bananas. Seriously that one sucked. What was Tim Burton smoking when he did that one? There are rumors that smoking banana skins can get you high, maybe Tim did that. 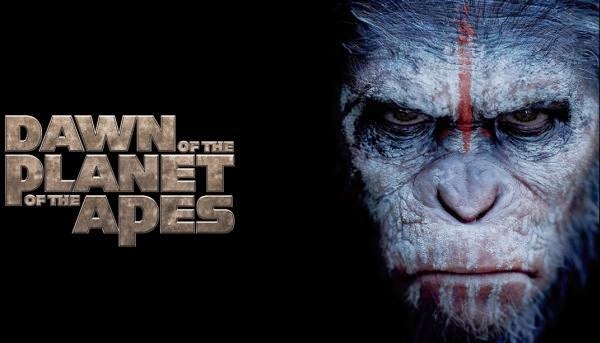 This one picks up ten years after Rise of the Planet of the Apes. Mankind is nearly wiped out and Caesar and the apes have started their own little civilization deep in the forest. The apes mind their own business. They hunt other animals, teach their young what they've learned so far and of their new society's rules. Things are going peachy keen until one day some humans venture into their territory. Things get serious from there. The humans need to go through their territory to get to a dam so that they can start up the hydroelectric generators. They've run out of batteries, petrol and diesel to run their lights and radios. So from here on it's like this. Apes no trust humans. Humans earn apes trust. Apes help humans. One human screws things up but apes give human second chance. One crazy ape no like human and want nothing to do with human. Crazy ape is suspicious and sneaks around and finds human weapon stash. Crazy ape take gun and shoot Caesar and blame human. Crazy ape start war with human. Big battle between humans and apes. Many apes die, Some get blown up and some get burned but apes strong and take down human city. Human now caged like ape in zoo. But Caesar not dead and Caesar son and human help Caesar to gain leadership. Caesar beats crazy ape but unfortunately in all the hubbub humans make contact with military so military sending big metal birds and other things to kill apes. And then the movie ends on this cliffhanger. It's a pretty good movie. A very good sequel to a brilliant reboot. But I do have one concern. Where do they go from here? In the original movies human astronauts somehow find themselves on earth that's been overrun by intelligent apes. Presumably they time traveled or found themselves in a parallel world of some kind. Tim Burton's version tried to remain true to the originals in that sense. But where does this series of movies go from here?